In this part of the review we look at items 2 and 3 of the system Both of these units can work with other sensors, but the ISS wireless sensors met my needs. It also allows me to move the sensor assembly around as I find the perfect location for it. The software did get loaded up on Windows 7 (supports back to Windows 2000) for some quick diagnostics. I will say the software was easy to configure and I was getting weather measurements as quick as I could install it (about 15 minutes). In the end the windows software seemed pretty limited and the interface was a bit clunky. I was much happier installing Linux wview open source weather package. I considered the IP version, but just couldn't justify the added expense. The serial version just seemed way to old fashioned and the USB unit was the same price. The envoy is a very compact unit that replaces the traditional LCD console. As with most things the dedicated consoles are nice for setup, but once things are connected to the internet, I usually never look at them again. I preferred this headless design, since the computer I wanted to hook it up to runs 24/7 in our basement. The unit is 6.5" x 3.75" x 1.5" thick and only weighs about 1/2 pound. The back of the unit allows for wall mounting (screws included). 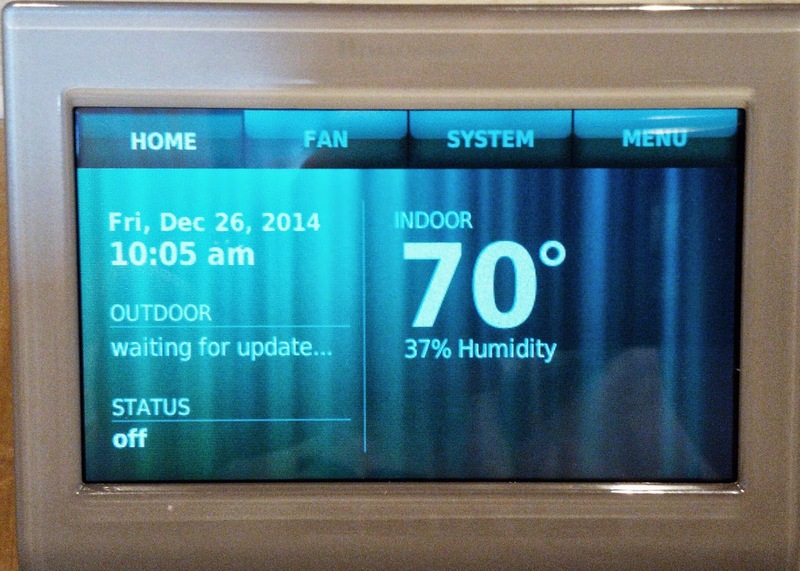 The unit also has internal temperature, humidity, and barometric pressure sensors - so think about where you mount it. You can easily get another measurement, if you mount it somewhere where temperature and humidity are not influenced by it's surroundings (like not next to a computer server exhaust fan). The USB data logger just pushes onto the circuit board of the Envoy. You have to remove the three screws on the back of the case and just push it down securely. The batteries are there to hold settings on the unit in the event of a power failure. The batteries provide 4 months of power for wireless units (only 1 month for cabled systems). The unit beeps twice to let you know that everything powered up correctly. Full Davis 6357 ISS sensor assembly (from the first part of this blog post) mounted on my back deck with the solar cell facing south. It is a bit of a bonus that the Envoy also has an internal temperature and humidity sensor in it. This give me the ability to measure long term fluctuations of the temperature wherever you have it mounted. In my case I have long term monitoring of my basement temperature and humidity. Overall my review of the unboxing an assembly process went well. Davis had quick start guides that really gave me the essentials I needed to quickly put the system together. The pairing of the Davis 6357 wireless sensor assembly and the headless 6316 Envoy unit was simple and "just worked". I enjoyed that the computer weather station system is modular. I can add and subtract the elements I want to make a system that meets my needs. Later on if I want to add or upgrade a sensor, I think it will be just as easy. If I need a repair part I think that Davis will also always be there. Quick question: Do the cables normally come with the software or the Weather Envoy? I ask because I recently bought the Envoy thinking I'd run wview and/or Xastir APRS software instead of the included Windows software. There's no indication anywhere I've found that shows what (if any) cables should be included with the Envoy. Cables came with the software (really the USB datalogger - 6510USB). The USB data logger is packaged with the software and the 8 foot USB cable -pictures above. I wish I could have just bought the data logger alone - I did run wview with my installation.